Internet Archaeol. 25. Williams. Studying the landscapes of Ancient Merv. 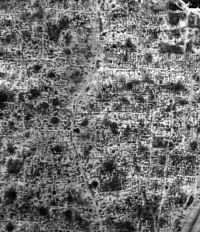 Figure 29 (left): Aerial photograph of a densely built-up urban quarter in Sultan Kala, crammed with houses, communal buildings, streets, alleys, courtyards and the Madjan Canal, flowing through the centre of the image from south (bottom) to north (top). 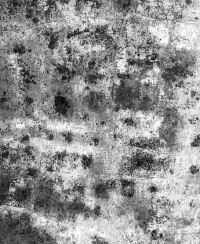 Figure 30 (right): IKONOS image of the south-east area of the city of Sultan Kala (north to top). The mausoleum of Sultan Sanjar is visible in upper left corner and the eastern wall of the city lies along the right-hand side of the picture. The main east-west road, near the top of the image, is heavily built-up, with properties running back from this major street frontage. But to the north, and especially the south, large areas of unbuilt space suggest possible intra-mural gardens, field and orchards. Many of these appear to be sharply demarcated from the built-up space, and some boundary walls are evident. Figure 31: IKONOS image of a quarter in the north-west of the city, with a large number of substantial building complexes, each apparently with extensive courtyards. The landscape of Sultan Kala contains a number of diverse areas: densely built-up urban quarters, crammed with houses and communal buildings (Fig. 29); intra-mural zones with gardens, fields, orchards and relatively few buildings (Fig. 30); areas packed with large buildings with extensive courtyards (Fig. 31); and extra-mural regions with industries, elite residences, fields, pasture, burials and mausolea (Fig. 32 - opens GIS). The city walls that are so visible today, on the ground and on aerial images, are an 11th-century construction: what is intra-mural and extra-mural at other times is an interesting debate. The term suburban is thus fraught with difficulties, but it is used in this article to denote those areas outside the 11th-century defensive circuit. Within these complex and diverse areas we have focused the attention of this pilot study on areas that help us to develop our research aims, and that give us data to explore how we construct interpretative ontologies. Two areas were explored: one within the 11th-century walls and one outside. 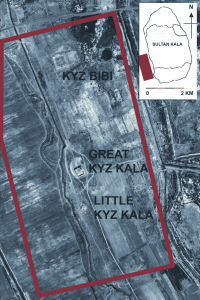 Within the suburban landscape we focused on an area south of the main east-west road running out of Sultan Kala, encompassing standing buildings (köshks), and where numerous complex features are visible on the aerial images, including possible caravanserais and gardens: a combination of functional, economic and elite spaces (Fig. 33). This area was also interesting as it raises a number of concerns regarding the management of the archaeological resource (park boundary, modern agricultural use, the nature of the buried resources, etc.). Within the urban landscape we first thought of focusing on a specific part of the cityscape to explore our methodologies and assumptions. In practice, however, we then decided that it was better to select different parts of the city as appropriate to the needs of each discussion or issue, drawing upon the diversity of the urban landscape. As a result, the urban study ranges across the whole cityscape.